BON HOFFA (AUS) (Chestnut 2002-Stud 2009). 9 wins to 1700m, MRC Sir Rupert Clarke S., Gr.1. Sire of 201 rnrs, 117 wnrs, inc. SW Bon Aurum (MRC Sir Rupert Clarke S., Gr.1), Deiheros and of Top Sight, Sweet Emily, Best Hoffa, Gibbon, Sallanches, Ambitious Speedy, Ample on Offa, Bon Elise, Bonee Tess, Galaxy Warrior, Good Offa, Hoffsetter, Never Without You, Vintage Bon, Allez Chival, Bon Rocket, I'm Ablaze, What a Buzz, Bons Away, etc. CHERRY TREE, by Forest Glow. Unraced. Dam of one named foal. Jiminy. 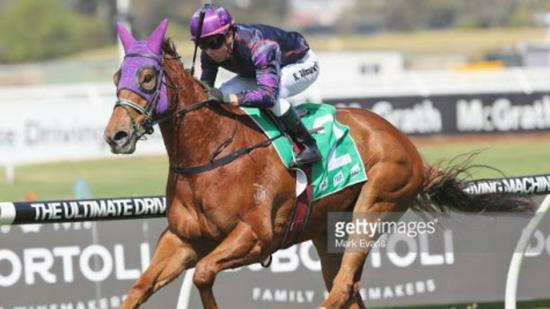 2 wins at 1600m, 1700m in Aust. Santa Bay. Placed in Aust. Festive Rock. Placed in Aust.